Growing unease with the current functioning of the global IIA regime, together with today’s sustainable development imperative, the greater role of governments in the economy and the evolution of the investment landscape, have triggered a move towards reforming international investment rule making to make it better suited to today’s policy challenges. As a result, the IIA regime is going through a period of reflection, review and revision. As evident from UNCTAD’s October 2014 World Investment Forum (WIF), from the heated public debate taking place in many countries, and from various parliamentary hearing processes, including at the regional level, a shared view is emerging on the need for reform of the IIA regime to make it work for all stakeholders. The question is not about whether to reform or not, but about the what, how and extent of such reform. WIR15 responds to this call for reform by offering an action menu. Based on lessons learned, it identifies reform challenges, analyses policy options, and offers guidelines and suggestions for action at different levels of policymaking. IIA reform can benefit from six decades of experience with IIA rule making. Key lessons learned include (i) IIAs “bite” and may have unforeseen risks, therefore safeguards need to be put in place; (ii) IIAs have limitations as an investment promotion and facilitation tool, but also underused potential; and (iii) IIAs have wider implications for policy and systemic coherence, as well as for capacity-building. Safeguarding the right to regulate for pursuing sustainable development objectives. IIAs can limit contracting parties’ sovereignty in domestic policymaking. IIA reform therefore needs to ensure that such limits do not unduly constrain legitimate public policymaking and the pursuit of sustainable development objectives. IIA reform options include refining and circumscribing IIA standards of protection (e.g. FET, indirect expropriation, MFN treatment) and strengthening “safety valves” (e.g. exceptions for public policies, national security, balance-of-payments crises). Reforming investment dispute settlement. Today’s system of investorState arbitration suffers from a legitimacy crisis. Reform options include improving the existing system of investment arbitration (refining the arbitral process, circumscribing access to ISDS), adding new elements to the existing system (e.g. an appeals facility, dispute prevention mechanism) or replacing it (e.g. with a permanent international court, State-State dispute settlement, and/or domestic judicial proceedings). Promoting and facilitating investment. The majority of IIAs lack effective investment promotion and facilitation provisions and promote investment only indirectly, through the protection they offer. IIA reform options include expanding the investment promotion and facilitation dimension of IIAs together with domestic policy tools, and targeting promotion measures towards sustainable development objectives. These options address home- and host-country measures, cooperation between them, and regional initiatives. Ensuring responsible investment. Foreign investment can make a range of positive contributions to a host country’s development, but it can also negatively impact the environment, health, labour rights, human rights or other public interests. Typically, IIAs do not set out responsibilities on the part of investors in return for the protection that they receive. IIA reform options include adding clauses that prevent the lowering of environmental or social standards, that stipulate that investors must comply with domestic laws and that strengthen corporate social responsibility. Enhancing systemic consistency. In the absence of multilateral rules for investment, the atomised, multifaceted and multilayered nature of the IIA regime gives rise to gaps, overlaps and inconsistencies between IIAs, between IIAs and other international law instruments, and between IIAs and domestic policies. IIA reform options aim at better managing interactions between IIAs and other bodies of law as well as interactions within the IIA regime, with a view to consolidating and streamlining it. They also aim at linking IIA reform to the domestic policy agenda and implementation. This WIR offers a number of policy options to address these challenges. These policy options relate to different areas of IIA reform (substantive IIA clauses, investment dispute settlement) and to different levels of reformoriented policymaking (national, bilateral, regional and multilateral). By and large, these policy options for reform address the standard elements covered in an IIA and match the typical clauses found in an IIA. A number of strategic choices precede any action on IIA reform. This includes whether to conclude new IIAs; whether to disengage from existing IIAs; or whether to engage in IIA reform. Strategic choices are also required for determining the nature of IIA reform, notably the substance of reform and the reform process. Regarding the substance of IIA reform, questions arise about the extent and depth of the reform agenda; the balance between investment protection and the need to safeguard the right to regulate; the reflection of home and host countries’ strategic interests; and how to synchronize IIA reform with domestic investment policy adjustments. Regarding the reform process, questions arise about whether to consolidate the IIA network instead of continuing its fragmentation and where to set priorities as regards the reform of individual IIAs. When implementing IIA reform and choosing the best possible options for designing treaty elements, policymakers have to consider the compound effect of these options. Some combinations of reform options may “overshoot” and result in a treaty that is largely deprived of its basic investment protection raison d’être. For each of the reform actions, as well as their combinations, policymakers need to determine the best possible way to safeguard the right to regulate while providing protection and facilitation of investment. In terms of process, IIA reform actions need to be undertaken at the national, bilateral, regional and multilateral levels. In each case, the reform process includes (1) taking stock and identifying the problems, (2) developing a strategic approach and an action plan for reform, and (3) implementing actions and achieving the outcomes. While reform steps at the national level (e.g. new model IIAs) or bilateral level (e.g. renegotiation of “old” IIAs) can play an important role in countries’ reform strategies, they risk perpetuating, if not exacerbating, the fragmentation and incoherence of the global IIA regime. Reform initiatives at the multilateral or regional level, although more challenging and time-consuming, offer a means to consolidate IIA reform by finding common solutions to widely shared concerns. Regional reform processes could span from a collective review of the underlying regional (and bilateral) treaty network to its consolidation. At the multilateral level, a global review and identification of the systemic risks and emerging issues could lead to consensus-building on key IIA reform issues that ultimately could feed into more coordinated approaches, including for future international investment rule making. Such efforts would be in the interest of consolidating and streamlining the IIA network and making it work for sustainable development. 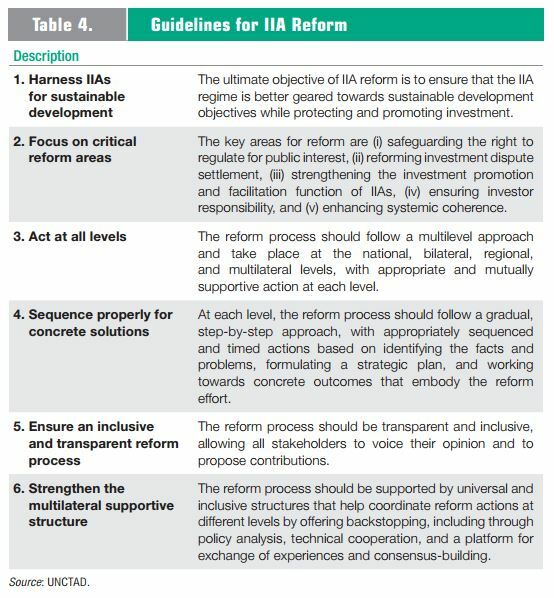 By presenting reform approaches, guidelines, tools, solutions, and a road map for the reform process, this WIR offers an action menu for IIA reform. It pulls together a variety of contributions that have been put forward in recent years, by UNCTAD and many others, on aspects of IIA reform. It invites countries to use this action menu and define their own road maps for IIA reform: countries can pick and choose the respective reform actions and options to formulate their own reform packages, in line with their individual reform objectives. All of this should be guided by the goals of harnessing IIAs for sustainable and inclusive growth, and determining the most effective means to safeguard the right to regulate while providing protection and facilitation of investment. The reform should focus on critical areas, include actions at all levels, take a systematic and sequential approach, ensure inclusiveness and transparency, and make use of multilateral support structures (table 4). In the absence of a multilateral system and given the huge number of existing IIAs, the best way to make the IIA regime work for sustainable development is to collectively reform it with a global support structure. Such a global support structure can provide the necessary backstopping for IIA reform, through policy analysis, coordination, management of the interaction with other bodies of law, technical assistance and consensus-building. UNCTAD plays a key role in this regard. Only a common approach will deliver an IIA regime in which stability, clarity and predictability help achieve the objectives of all stakeholders: effectively harnessing international investment relations for the pursuit of sustainable development.